One month with Ava Giselle! I can’t believe my sweet pea, Ava is one month old already! Alleluia! We made it ONE whole month as a family of four. I said this before in a blog post I wrote about Zoe’s first 6 weeks earth side (read about it here), but… it’s definitely been a roller coaster ride, lots of ups and downs, but tons of love in between. The newborn stage is so incredible to me – when baby is seeing the world for the first time. As a new family of four we are all trying our best to adjust as we get to know Ava and she gets to know us, and our new roles, especially Zoe as a big sister. And although, the last month has really given me the opportunity to get to know Ava, the whole time she has been trying to get to know herself and the beautiful world around her. And of course, as the days go on she will grow and her identity will change and develop even more. But let me introduce you to Ava Giselle, our littlest family member. Ava is my super snuggly sweet pea and when I say snuggly I mean it. She really doesn’t like being put down. After a full month, this little lady is just now getting use to her car seat. Bassinet forget it, Ava prefers sleeping in mommy’s arms. I haven’t been swaddling her because she’ll kick through it, but she seems comfortable in a sleep sack. She loves breastfeeding and I actually have yet to use my breast pump or feed her with a bottle. She hates her pacifier and always spits it out. She loves laying on her side and tummy. 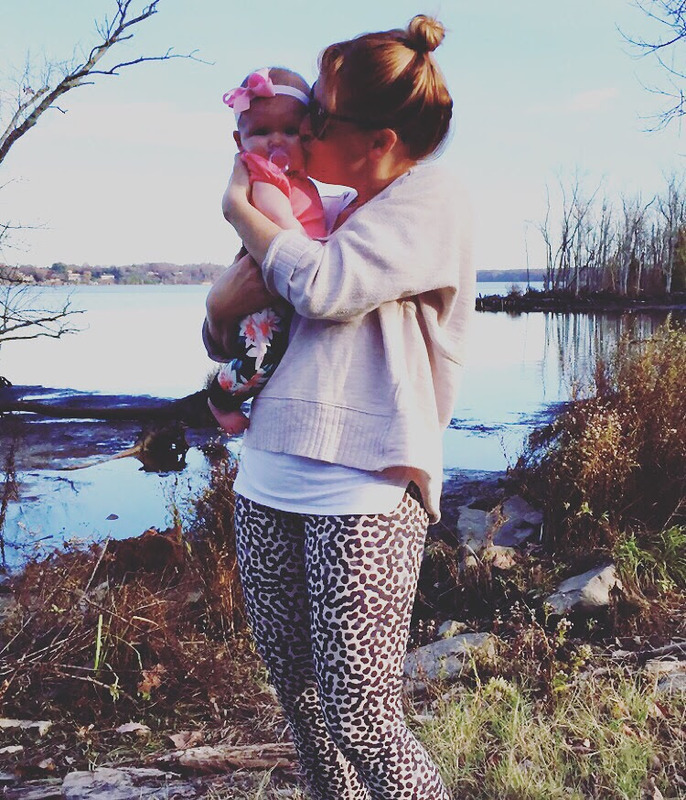 She is always squirming – which makes since I could constantly feel her squirming around in my belly. As you can see Ava is so different compared to the way Zoe was as a newborn – who easily bottle fed, loved her pacifier, slept really well on her back, and hated tummy time. At Ava’s two week wellness check (4/4/18) she gained back her birth weight plus two ounces, weighing in 8 pounds 14 ounces. Unlike Zoe, who from day 1 did not naturally take to breastfeeding, Ava is a breastfeeding champ. On her first try, she opened her mouth wide and latched on to the breast. 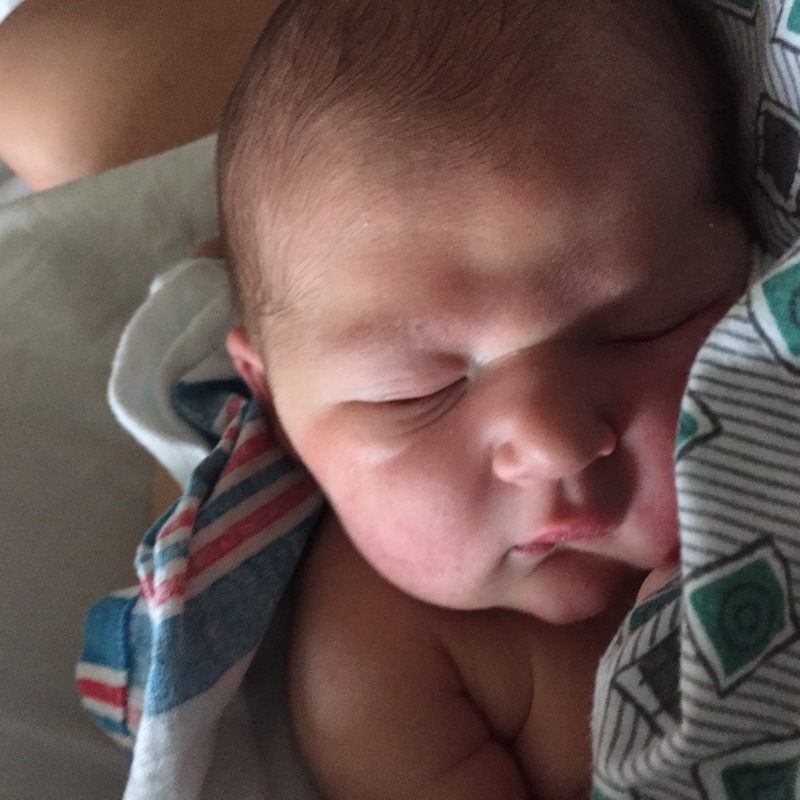 Maybe I was more relaxed on day one, knowing that I was totally happy, with bottle feeding and supplementing with formula, if my newborn preferred it. Maybe I was just more knowledgeable with breastfeeding positions and knew it took 3-4 days for my milk supply to come in and once it came in it came in flowing. So for the last month, I’ve been breastfeeding Ava on demand. Similar to Zoe, Ava loves long walks in the stroller. We took the double BOB for a stroll on the one warm sunny day we have had. Ava fell right to sleep. I’m hoping for more warm sunny days, so we can walk more and sleep more. Today, April 17th, 2018, we went to her one month wellness check. She has gained 1 whole pound and 1 ounces since her two week visit, weighing in 9 pounds 15 ounces. She is recognizing our voices. Focusing her eyes. Crying loud with a shrieking squeal. This girl wants to be heard – She is so loud. She hated getting her shot today, and was very dramatic about it. Although, I loved “one on one” time with Ava in the hospital, I missed Zoe. Once I got home, it was very hard, because I am recovering from a c-section and can not fo any heavy lifting, meaning I can’t pick up Zoe… This concept is difficult for Zoe to understand, and it annoys me. At 4 weeks post c-section I still shouldn’t lift anything besides the baby. I’ve taught Zoe to climb into her car seat, stroller, stairs, etc. It also has been horrible weather. So cold, windy, wet etc. It snowed the day we took Ava home. We have only had one sunny warm day and it was an amazing day spent outside walking and playing. I just desperately want the weather to warm up and stay warm so we can have more days like that. Zoe’s regular routine was altered when baby Ava came, which was hard. So as a mother of two, it’s my job to make sure I give equal attention to both of my girls. I need to make sure I continue to practice patience with Zoe. I also need to continue to include her in everything, and make sure she and I still have “one on one” time. I don’t brag enough about him, but my husband has been pretty amazing. He has really stepped it up trying to make sure we are all taken care of. It has been really hard to go to all of the doctors appointments, (I forgot about all of the appointments) but he’s come to help me at most of them. He has gone grocery shopping and has cooked us some awesome dinners. He even has brought me Starbucks… I’m lucky to have him! So as you can see, we are doing well as a family of four! Zoe Turns One, Read her Birth Story! On August 19th, 2015, my sweet baby Zoe was born. I can’t believe a whole year has come and gone. 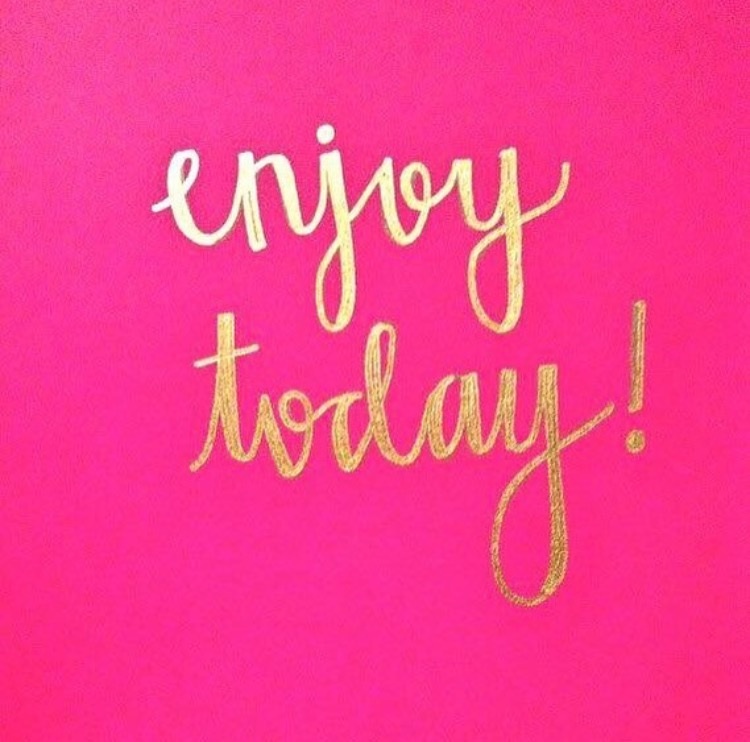 This first year has been one amazing year, full of the most fun, a little chaos, lots of new memories, so much joy. It has been truly amazing watching little Zoe grow, explore, discover, with eyes wide…seeing everything for the very first time. It has been an incredible year of growth for all of us. As she learns new things, we learn new things about ourselves. As we teach her, she teaches us. Thank you Zoe, for making my life so complete, and filling it with so much love, beauty, and joy. In honor of Zoe’s first birthday, read her cBirth Story! Zoe is getting bigger, stronger, and even more beautiful and more intelligent than the day before. She recognizes familiar sites and sounds. They say at birth a baby will know her mother. This may be true, but I didn’t really recognize this until week 10-11. When I hand Zoe off to people, she curls her lip to pout and reaches for me – she knows I’m her mama. When Erik picks her up from her babysitter’s house, her whole face lights up with excitement – she knows he’s her daddy. Now at 3 months when we leave the room, she follows us with her eyes, and even turns her head in our direction to look for us, or wait for us to return. When she sleeps at night, in her bassinet, she turns her head to the side, to face our bed. Because of this we have been changing up her sleeping position by putting her in her bassinet the opposite way, every other night. It is important to do this because her head and face is still forming. The other thing she is recognizing is her bottle, and the sound of her milk being stirred or shaken. She uses her senses to explore. As a newborn, a baby will use their sense of smell, to determine who their mother is because their sight is not yet fully developed. When I take Zoe for walks, many times she still doses off to nap. However, there are also many times she is alert looking around. She loves the fall trees, the leaves – bright and colorful. Zoe can now see full colors. Did you know babies at 14 weeks prefers blue and red?! Zoe loves to feel different textures. She loves all the textures on her play mat. She grabs her blankets to feel the softness. She loves her silk blanket her great Aunt made her, and even tries to eat it. She grabs on to my hair, clothing, even enjoys holding my hand. Zoe now has discovered her own body parts. She touches her ears and always puts her hands in her mouth. She uses her hands to learn and explore. When she was a newborn her hands were always in a fist, and I always had to wipe her hands down because they were full of lint. Now she keeps them open and has realized she has fingers. Now I wipe them down because she is always eating then. At week 13 she really began to hold objects. I see her holding her pacifier and when I hand her her mermaid doll she holds it. Zoe has always loved the sound of music. Early on, I would sing her Christmas songs, such as Silent Night to soothe her and help her fall asleep. At around 10 weeks I made up a cute song that uses our names, to teach her, that she is Zoe and that I am her mama. The music that plays from her swing stimulates her. She kicks her legs as if she is dancing. When she was in my belly I used the belly buds so she could listen to music. I played for her a ton of Lindsay Stirling. Now at 3 months she is more playful, I want to play more classical and modern classical music, it is good stimulation for babies. There are a lot of other noises that she loves. Her white noise sound machine is part of her night time routine. She loves the sound of water, and sits in the bathroom quietly while I take a shower. She also loves the sound of the hair dryer. She loves the sound of the bathroom fan. She enjoys the fabric that makes noise on her play mat while she kicks and plays. The dogs’ barking does not even phase her. When Zoe is tired she tells me by rubbing her eyes and yawning. However, a regular routine is good for Zoe. It helps her attention and memory. I just finished the book, “Bringing up Bebe.” It is a parenting book about how the French parent. In the book, the author claims, that the main question asked in France is, “Does your baby do her nights?”- meaning is your baby sleeping through the night. Well I am very proud to say, Yes! Zoe is sleeping through the night. I truly believe this has a lot to do with giving her a dream feed. I have found that as long as Zoe has a full belly she will sleep peacefully. Zoe is loving her bath time. She kicks her legs and splashes hard. It is fun to watch her expressions. She use to scream her head off when we took her out of her tub, but now she gets wrapped up in her towel quickly, and once she is dry I give her a baby massage with baby oil. She is using the Earth Mama Angel Baby products. We love them. Zoe is eating 4-5 ounces at each meal. She is definitely spitting up less, but drooling like crazy – she even blows bubbles. Drool is saliva that lines the intestines and neutralizes stomach acid. It contains enzymes that helps digest food. The body is preparing to take in solids. In a couple months she will be ready. Zoe is now talking – baby talk. She spits out her pacifier so she can smile and babble. When I ask her a question she answers in baby talk. I still tell her where I’m going and what I am doing. We have conversations all the time. This Wednesday Zoe will be 15 weeks. The last couple days she has been the best alarm clock ever. She has been laying in her bassinet happily oohing and aahhing, and squealing! She thinks it is fun! I love it. Loudest baby alarm clock ever. Zoe use to hate tummy time. It is crazy how in just a couple days she has turned into a pro on her tummy. It is a lot of work for a 3 month old to do her push ups. But she is now doing them with out crying instantly. She loves her tummy time mat. 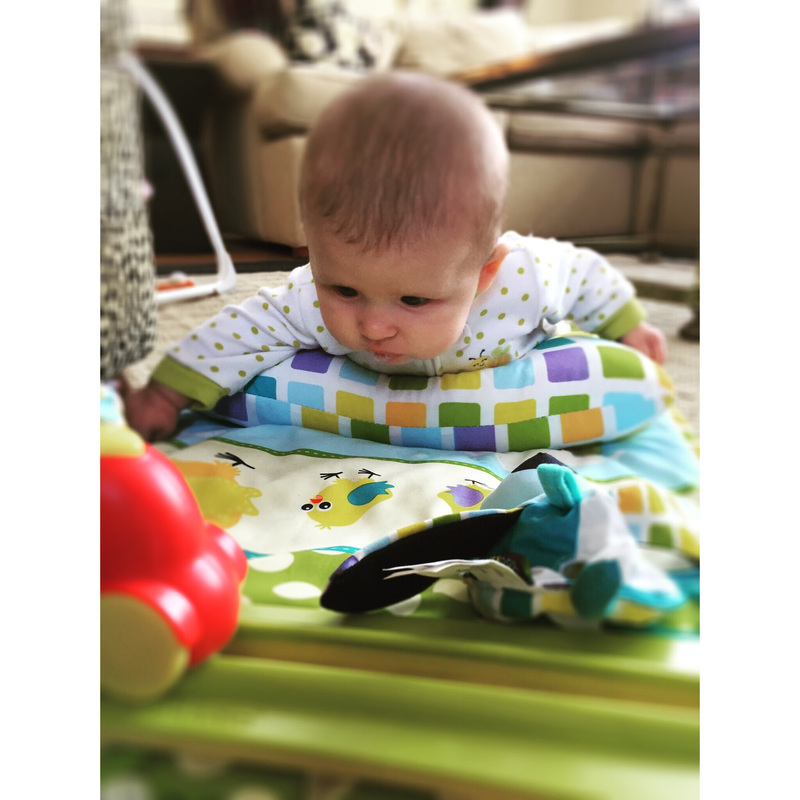 It is important to get babies use to tummy time and getting them to associate this time as play time. She is playing and getting stronger. It’s time for more toys and books. I read many books to Zoe. Her favorites are the pout pout fish and Boom Chicka Boom. We are starting to create a library for her. We are also bringing out more toys for her to play with. She had a mermaid rattle but I think I might introduce Sophie to her soon. Every day with Zoe, I think… this is the best day, but then the next day comes, and she surprises me, yet again with something cuter and more fun than the day before. She is always smiling, and when I smile at her… she smiles back. 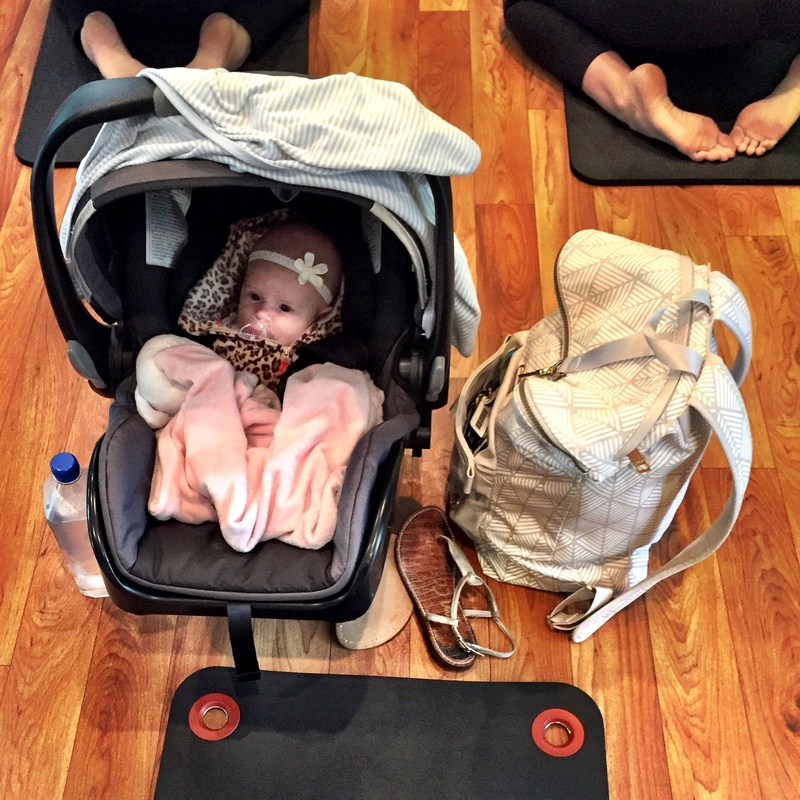 I have been wanting to try Mommy & Me (Baby) classes at Mind the Mat Yoga Studio, since the week I found out I was pregnant. My friend Mariana went with her baby (Jasper) when she still lived in the area and she really enjoyed the classes. Along with her, I also know a couple of other mamas who have participated in the Mommy & Me classes at the studio and they too were really impressed. The studio offers Mommy & Me classes in pilates, yoga, and barre. However, because I was recovering from my c-section I wasn’t able to do any type of exercising with the exception of walking, until I got cleared from my doctor. This was disappointing for me, because I really wanted to take Zoe to the Mommy & Me classes earlier, during my maternity leave – instead I finally just got to take her, this last week. We joined Piper and Lindsay at the Mommy & Me pilates class on Tuesday, and then went to the Mommy & Me yoga on yesterday (Friday). Both classes are for babies before crawling age. The pilates class focuses on lower body, mainly glutes. This class is definitely a workout for the mamas. I was squatting and sweating while Zoe stayed in her car seat napping. It is especially important for breast-feeding mamas to get a good booty workout in considering breast milk is made from the fat from your booty. The yoga class is less intense then the pilates class. The first half of the class is for the mamas and focuses on the core muscles. The last half of the class is for the babies. This part was by far my favorite part, because nothing is better then having your baby smiling. Zoe absolutely loved it. During the first half, while I was stretching, Zoe was watching me, smiling. Then during the second half, it was Zoe’s turn. I took her out of her car seat, and stretched her toes to her nose. I bicycled her legs, rotated her hips, stretched out her arms, and legs. While taking care of a baby, it is easy for a mama to forget to take care of herself. However, taking care of yourself is one of the most important things. It can be really hard to find time to work out especially when you don’t have family to help watch your little one. This is why I love these classes. There are very few workout classes that allow you to bring your baby with you, and most gym daycares don’t allow young babies. I will admit that I have never been to a louder class. Some babies were screaming their heads off, but because we are all mamas in the classroom, screaming babies do not even phase us. If you are a mama in the DC area who has a baby who isn’t crawling yet, I highly recommend trying these classes. 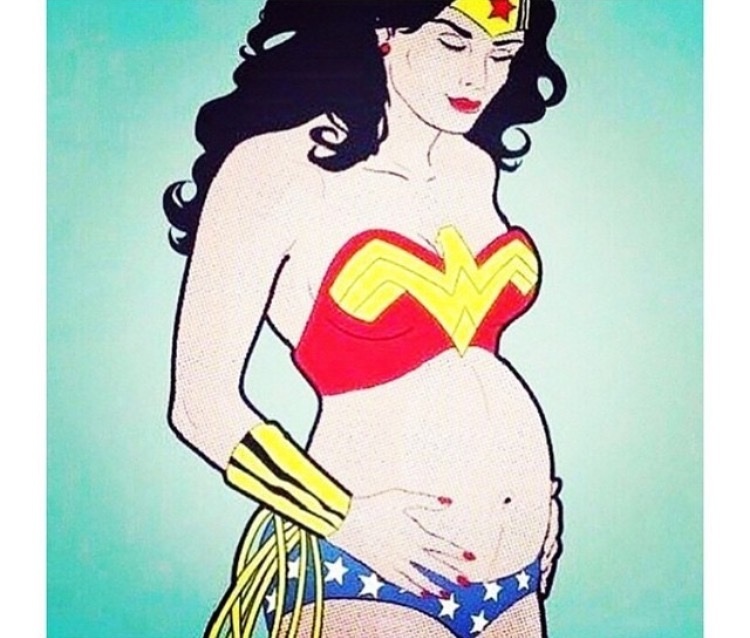 And if you are a mama to be, try their prenatal yoga class – it is amazing! Just like the Wedding Industry, when it comes to pregnancy and baby stuff, it is quite the business. There is so much stuff out there that creating a registry becomes a very overwhelming task, especially when experts say, what may work great for one baby, may not work well for another. Start your registry by prioritizing what items are most important to you. I started my registry, by prioritizing what was the most important baby and pregnancy items, for my husband and I. For example, stroller, car seat, and carriers were on the top of my list. Once I narrowed it down, I researched these items in detail. Also some of the baby books I read, touched point on some important must have items. Next, determine what is important to you based on your lifestyle. Are you on a budget? Do you travel often? Do you live in a small space? Do you hike or run? What kind of car do you have? We decided what was important to us based on our lifestyle. One of the main thing that was important to me was I wanted my baby products to be green, organic, chemical free, and as environmental friendly as possible. This meant, glass baby bottles instead of plastic, environmental friendly diapers, an organic mattress etc. Because your baby only uses some of these items for a short time, my husband was more worried about the cost and staying on a budget. We both wanted to try to stay as minimal as possible, registering for things we really needed. We also live in a small 1950s duplex, so having space for a lot of big things were out of the question. I am a runner so I definitely felt having a running stroller was a huge necessity for me, plus it is sporty for my husband to use as well. My friend, Mariana, who recently had a baby, her main priority was all of her baby items had to be light weight and portable, since she travels and moves often. Ask other moms, ask a friend to help you. I was also lucky enough to have my friend Mariana help me with my registry. She was the biggest help walking me through Buy Buy Baby, pointing out the things she loves and the things she just didn’t need. I also have a couple friends who just had babies in April and May, and some that are due in July. I took a look at their baby registries, just to see if they had items on there, that I may have forgotten to put on mine. Where should you register? There are a lot of great places to register at. I ended up choosing Buy Buy Baby and Amazon. Buy Buy Baby is affiliated with Bed Bath and Beyond. You can use your Bed Bath and Beyond coupons there and they match prices. Amazon is great because a lot of people have amazon prime. Also some items that I couldn’t find at Buy Buy Baby, I found on Amazon. Another great place to register is with MyRegistry.com. This is a website that lets you combine items from several different stores. Also take note: If you are going to get a running stroller, you may consider getting it at REI. My husband surprised me with our running stroller and car seat. He ended up getting it at REI on sale during Memorial weekend. This brings up a very important question… what do you need? Do you really need all of this baby stuff? Our moms and grandmas raised us just fine with out all this extra stuff. When choosing baby items, it really depends on your lifestyle and living space. At the end of the day, the ultimate question is not do you need all this stuff, but rather, what will make your life easier? If you are in the process of making a baby registry, check out my registry for ideas. Or if you have already made one, you can compare your registry to mine. My baby registry at Buy Buy Baby and Amazon. What is your must have baby item? Was there a product you or your baby couldn’t live with out?